Abstract: In this review PCSTATS is testing AMD's latest mainstream quad-core chip, the 3.1GHz Athlon II X4 645 processor. Architecturally speaking the Athlon II X4 645 is identical to the preceding Athlon II X4 635 model, except for a modest clock speed increase. In this review PCSTATS is testing AMD's latest mainstream quad-core chip, the 3.1GHz Athlon II X4 645 processor. Architecturally speaking the Athlon II X4 645 is identical to the preceding Athlon II X4 635 model, except for a modest clock speed increase. If you're familiar with the preceding few Athlon II X4 6-series CPUs you'll know what to expect so jump ahead to the overclocking results and benchmark tables. Bringing the AII X4's four cores past the 3GHz threshold affords incremental gains of course, and the Athlon II X4 continues to be an ideal CPU for media PCs, particularly when paired an AMD 890GX motherboard. If faced off against an Intel Core i5 or AMD Phenom II X4 chip the Athlon II X4 family will bring up the rear, but if you're in need of a good all-around home PC system and don't have much cash to splash around the platform offers exceptional value. AMD's Athlon II X4 645 is a native socket AM3 processor and is backwards compatible with older socket AM2+ motherboards, an element that is clearly missing from Intel's expanding circus of sockets. Just like the flagship processors, the Athlon II X4 645 will support 32-bit or 64-bit versions of Microsoft Windows 7/Vista/XP operating system, but best of all it's priced at an economical $122USD. On the spec front, AMD's 3.1GHz Athlon II X4 645 processor features 512KB of L2 cache for each of its four cores, for a total of 2MB. 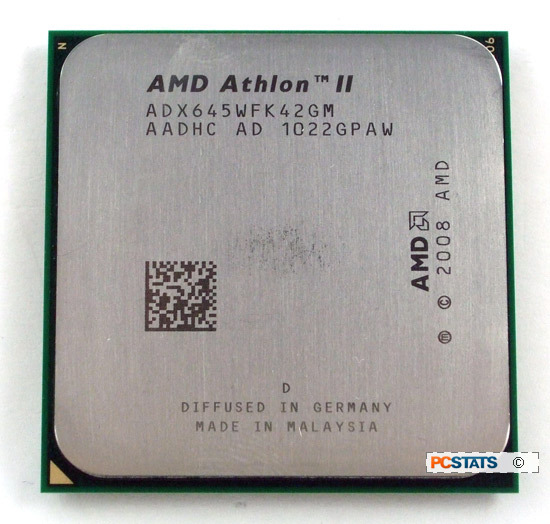 Unlike the Phenom II quad-core designs, the Athlon II X4 lacks any L3 cache. Platform compatibility is broad thanks to both DDR2 and DDR3 onboard memory controllers, making it possible to install this processor on motherboards that support DDR2-1066 or DDR3-1333 memory. For this review PCSTATS has selected the ASUS Crosshair IV Forumla (890FX) motherboard and 4GB of Corsair XMS3-1600C9 DDR3 RAM. If you're building a new PC it's wise to go the DDR3-route as DDR2 is being phased out. Manufactured on a 45nm SOI process at the Global Foundries Fab 1 module in Dresden Germany, the Athlon II X4 645 is built on AMDs "Propus" core - essentially a slimmed-down version of "Deneb" that's been around since first Phenom II processor. This core design consists of four individual computational cores (4-core, 4-thread) with 512KB of L2 cache for each. The monolithic silicon die measures 169mm2 and contains 300 million transistors. Thermal Design Power (TDP) sits at a moderate 95W. As you might expect, the 3.1GHz Athlon II X4 645 processor supports full hardware virtualization, so individual cores can be assigned to virtual machines. Built in virtualization is one of the big features of Microsoft Windows 7, and it is this that makes running Windows XP Mode inside of the Windows 7 operating system possible. Retailing at launch for$122 CDN ($122 USD, £75 GBP) , the Athlon II X4 645 processor continues to be one of the most affordable quad-core CPUs on the market. Its primary competition will be coming from AMD's own Phenom II X3 processors and Intel's Core i5 processors. Fast L3 cache is important for communication between processor cores and multi-threading efficiency. When all four cores are busy processing threads the L3 cache acts as sort of a pool that feeds the individual L2 caches. Ultimately the absence of L3 cache in the Athlon II family of processors increases the frequency that the chip has to fetch information from system memory or virtual memory (hard drive), both of which are orders of magnitude slower than accessing quick on-die L3 cache. In applications which rely on streaming a lot of data into all four cores of the computer processor from memory, the lack of L3 cache will hamper the AMD Athlon II X4 645 processor's performance compared to equivalently paced quad-core Phenom II chips. Let's see how this Athlon II compares in the very competitive mainstream processor field. First up a quick look at power consumption then PCSTATS will head straight into overclocking and then our extensive benchmark set. CPU power draw (expressed in Watts) can be easily measured by way of total system power if you have a simple electrical power meter. To determine how much juice the CPU is consuming, we only need to compare power draw with the processor resting at idle, and with each core at 100% CPU utilization. For an accurate measurement it's necessary to disable power saving features and CPU clock speed throttling technologies like Cool 'n' Quiet, EIST (speedstep) and C1E power states, etc. To stress each core in the processor individually, PCSTATS uses a free program called Stress Prime SP2004). The power draw for the Athlon II X4 645 PC increases to 193 Watts with all four cores 100% stressed. Compared to the considerably faster Core i5 750 system (169W), the Athlon II X4 645 system demands a lot. AMD really needs to move its Athlon II processors to 32nm. Next up, PCSTATS overclocks the Athlon II X4 645 chip towards 4GHz, then it's onto the processor benchmarks! Pg 15. Incremental Clock Boost, Minor Gain?